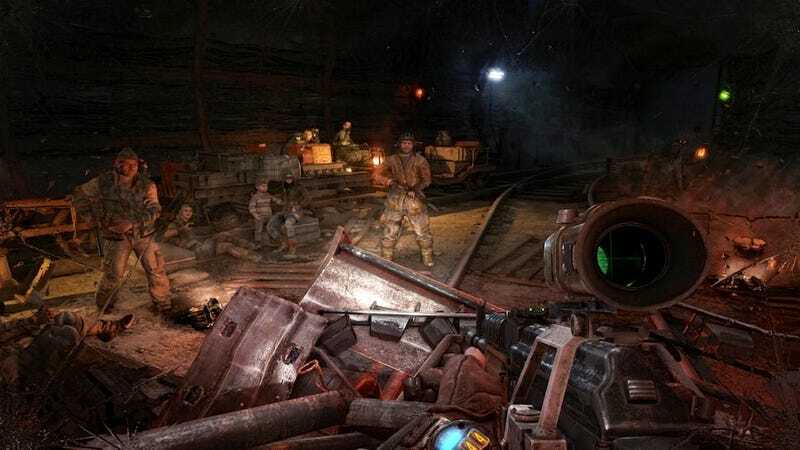 When the Metro 2033 was released in 2010 it contributed to raise the PC graphics bar making good use of the latest DirectX 11 rendering technologies such as depth of field and tessellation along with high resolution textures. Before that little was known about the developers of Metro. 4A Games was founded by Oles Shiskovtsov and Aleksandr Maksimchuk, former programmers at GSC Game World, who left about a year before the release of S.T.A.L.K.E.R. : Shadow of Chernobyl. It's no coincidence that Metro 2033's visuals bared resemblance to those of S.T.A.L.K.E.R, though we would argue that they were better. Both Shiskovtsov and Maksimchuk had worked on the development of the X-Ray engine that powers GSC's first person shooter. Metro: Last Light 82 follows its predecessor roots by using a heavily customized version of the 4A Engine. Three years of extra work put into the engine and you can take for granted that visual effects such as lighting, which was a huge focus for 4A Games in the original Metro have been vastly improved. There's also a lot more destruction and interactivity into the environments. According to 4A, the custom nature of the engine allowed them to focus on improving and creating new sections instead of trying to repurpose existing ones that were made by other developers for different mechanics. Furthermore, the developer has continued to cater to loyal PC gamers who have considerably more power than console gamers at its disposal by including a richer gaming experience visually as well as a benchmark tool for measuring your system's performance. The Metro series is set some years after nuclear war has ruined the surface of the Earth and put an end to civilization as we know it. In Russia, survivors have retreated to the Metro, re-forging a bleak semi-existence in the tunnels beneath the city. This is the sort of game that mentions, in its opening cinematic, the very real possibility that God is dead. Although we jumped to test Metro: Last Light at the first opportunity we got, we had to delay this performance review until both Nvidia and AMD cards were performing up to par. We tested almost 30 DirectX 11 graphics card configurations from AMD and Nvidia covering all price ranges. The latest drivers were used, and every card was paired with an Intel Core i7-3960X to remove CPU bottlenecks that could influence high-end GPU scores. Although we usually rely on Fraps to record up to 90 seconds of gameplay for our benchmark data, 4A has provided us with an easier method that is also more accurate. Last Light's rolling demo runs for almost 3 minutes and plays out a number of very detailed battle scenes. The benchmark tool allowed us to create our own graphics quality presets. In total we went with nine major tests covering three resolutions and three quality settings. We tested Metro: Last Light at three common desktop display resolutions: 1680x1050, 1920x1200 and 2560x1600 using DX11. We also tested using three visual quality presets: Very High, High and Medium and an additional test for SSAA. Using high quality settings there is an obvious drop in performance from what we observed on the previous page. The GeForce GTX 660 went from 60fps in medium, down to 45fps in high. Likewise the Radeon HD 7850 dropped from 56fps to just 40fps. Both still offered playable performance but given the resolution we don’t expect to go much farther. The GeForce GTX 670 was able to deliver 60fps, while the Radeon HD 7950 Boost just fell short with 59fps. The Radeon HD 7970 GHz Edition was slightly slower than the GeForce GTX 680 rendering 66fps opposed to 67fps. As expected when increasing the resolution to 1920x1200 the GeForce GTX 660 and Radeon HD 7850 dropped below 40fps. Mid to low-end cards don't fare all that well as the Radeon HD 7790 managed just 28fps and the 7770 a mere 21fps. Metro: Last Light is proving to be a challenge if you want to play at 2560x1600 or let alone multi-monitor resolutions. The GeForce GTX Titan averaged just 48fps here and keep in mind this is not the highest quality setting preset. The GeForce GTX 660 Ti SLI cards turned in 43fps making them faster than the Radeon HD 7970 GHz Edition and GeForce GTX 680 cards which both managed 39fps. The Radeon HD 7950 and GeForce GTX 670 averaged 32fps and 34fps, making them the slowest cards we would bother trying to play with at this resolution. Metro's very high quality settings at just 1680x1050 is already looking like a seriously demanding benchmark. The GeForce GTX 680 fell short of the 60fps target with 57fps, while the Radeon HD 7970 GHz Edition was slower again with 56fps. The mid-range GeForce GTX 660 Ti and Radeon HD 7950 cards averaged 47fps and 45fps, while the Radeon HD 7870 and GeForce GTX 660 dipped below 40fps. Only the GeForce GTX Titan was able to average over 60fps at 1920x1200. Mid-range graphics cards such as the GeForce GTX 660 and Radeon HD 7870 just managed to pass the 30fps mark. Those wanting to play Metro Last Light at extreme resolutions in all of its glory are asking for a somewhat unrealistic scenario for the time being considering we wouldn't pay for a GTX Titan and then run a game at just 41fps no matter how well it looked. This score was matched by a pair of GeForce GTX 660 Ti SLI cards.